Murphy’s. The Waterfront Warehouse. Historic Properties. Bishops Landing. 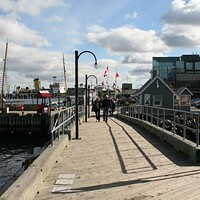 The Maritime Museum of the Atlantic. That big blue wave that always reminds us of a giant, chilly tongue. There are plenty of things down on the waterfront to impress your land-lubber cousins from Alberta. You’ll find plenty to enjoy at the annual Busker’s Festival, and in the summer of 2009, expect another flotilla of tall ships to glide into the harbour like a bank of enormous swans. And, for the price of a toonie---well, a couple, if you plan to come back from Dartmouth---the ferry gives you and your visitors a great look across the water, whatever the season.